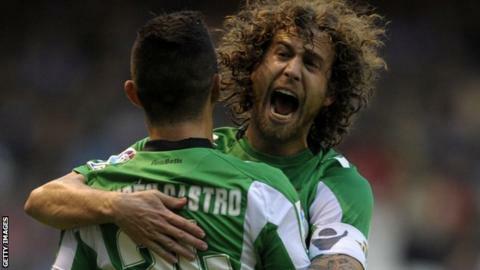 Jose Canas will join Swansea City on a free transfer from Real Betis when his contract expires at the end of June. The 26-year-old midfielder, who helped Betis to seventh place in La Liga, has signed a pre-contract agreement to move to the Liberty Stadium. Canas has long been linked with Swansea, who tried to convince Betis to sell during January's transfer window. He will join fellow Spaniards Angel Rangel, Chico Flores, Pablo Hernandez and Michu at Swansea next season. The defensive midfielder is a product of Betis's youth system but rejected an offer to sign a new contract.